Foie gras (French for "fat liver") is a food product made of the liver of a duck or goose that has been specially fattened. This fattening is typically achieved through gavage (force-feeding) corn, according to French law, though outside of France it is occasionally produced using natural feeding. Left: Foie gras with mustard seeds and spring onions in duck jus. The feed, usually corn boiled with fat (to facilitate ingestion), deposits large amounts of fat in the liver, thereby producing the buttery consistency sought by the gastronome. Foie gras is a popular and well-known delicacy in French cuisine. Its flavour is described as rich, buttery, and delicate, unlike that of a regular duck or goose liver. Foie gras is sold whole, or is prepared into mousse, parfait, or pâté (the lowest quality), and may also be served as an accompaniment to another food item, such as steak. French law states that "Foie gras belongs to the protected cultural and gastronomical heritage of France." The technique of gavage dates as far back as 2500 BC, when the ancient Egyptians began keeping birds for food and deliberately fattened the birds through force-feeding. Today, France is by far the largest producer and consumer of foie gras, though it is produced and consumed worldwide, particularly in other European nations, the United States, and China. Gavage-based foie gras production is controversial, due to the force feeding procedure and the possible health consequences of an enlarged liver that could be faced by the duck or goose. A number of countries and other jurisdictions have laws against force feeding or the sale of foie gras. Fully cooked preparations of foie gras are generally sold in either glass containers or metal cans for long-term preservation. Whole, fresh foie gras is usually unavailable in France outside the Christmas period, except in some producers' markets in the producing regions. Frozen whole foie gras sometimes is sold in French supermarkets. Generally, French preparations of foie gras are over low heat, as fat melts faster from the traditional goose foie gras than the duck foie gras produced in most other parts of the world. American and other New World preparations, typically employing duck foie gras, have more recipes and dish preparations for serving foie gras hot, rather than cool or cold. Traditional low-heat cooking methods result in terrines, pâtés, parfaits, foams and mousses of foie gras, often flavored with truffle, mushrooms or brandy such as cognac or armagnac. These slow-cooked forms of foie gras are cooled and served at or below room temperature. Many presentations of foie gras match it to a sweet fruit, including quince, pears, apples, prunes, plums, cherries, raspberries, blackcurrants, huckleberries, figs or elderberries. These can be in the form of sauces, coulis, jam, stewed, caramelized or pureed. Left: Moulard duck foie gras with pickled pear. Sauces include onion or leek-based sauces, red wine or fortified red wine reductions, truffle and mushroom sauces or wasabi drizzles. It is commonly served accompanied with crusty or toasted bread such as a brioche, or, more rustically, toasted baguette ends. If wine is drunk with foie gras, it is generally white wine, often very sweet, such as Sauternes or Monbazillac. Foie gras is a luxury dish. In France, it is mainly consumed on special occasions, such as Christmas or New Year's Eve réveillon dinners, though the recent increased availability of foie gras has made it a less exceptional dish. 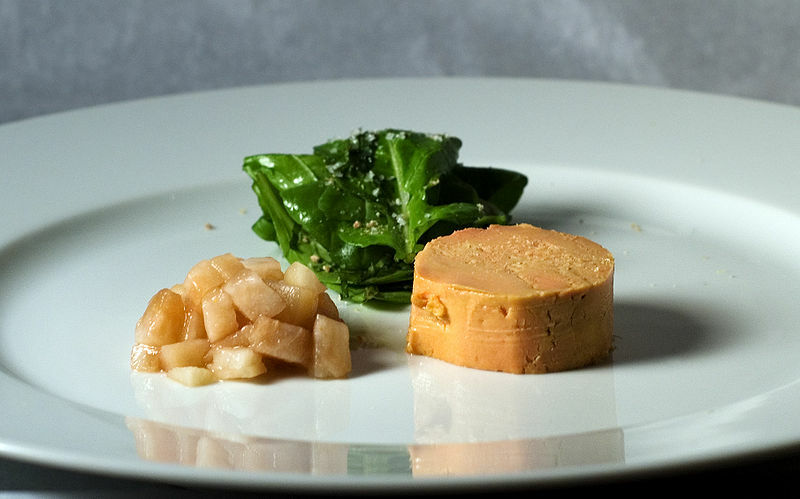 Duck foie gras is the slightly cheaper and, since a change of production methods in the 1950s, by far the most common kind, particularly in the US. The taste of duck foie gras is often referred to as musky with a subtle bitterness. Goose foie gras is noted for being less gamey and smoother, with a more delicate flavor.